BICEP MUSCLE BUILDING: The biceps is tri-articulate, meaning that it works across three joints. The most important of these functions are to supinate the forearm and flex the elbow. These joints and the associated actions are listed as follows in order of importance Proximal radioulnar joint - Contrary to popular belief, the biceps brachii is not the most powerful flexor of the forearm, a role which actually belongs to the deeper brachialis muscle. The biceps brachii functions primarily as a powerful supinator of the forearm (turns the palm upwards). This action, which is aided by the supinator muscle, requires the elbow to be at least partially flexed. If the elbow, or humeroulnar joint, is fully extended, supination is then primarily carried out by the supinator muscle. Humeroulnar joint (Elbow) - The biceps brachii also functions as an important flexor of the forearm, particularly when the forearm is supinated. Functionally, this action is performed when lifting an object, such as a bag of groceries or when performing a biceps curl. When the forearm is in pronation (the palm faces the ground), the brachialis, brachioradialis, and supinator function to flex the forearm, with minimal contribution from the biceps brachii. Glenohumeral joint (Shoulder) - Several weaker functions occur at the glenohumeral, or shoulder, joint. 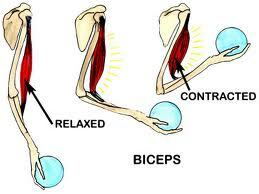 The biceps brachii weakly assists in forward flexion of the shoulder joint (bringing the arm forward and upwards). It may also contribute to abduction (bringing the arm out to the side) when the arm is externally (or laterally) rotated. The short head of the biceps brachii also assists with horizontal adduction (bringing the arm across the body) when the arm is internally (or medially) rotated. Finally, the long head of the biceps brachii, due to its attachment to the scapula (or shoulder blade), assists with stabilization of the shoulder joint when a heavy weight is carried in the arm.